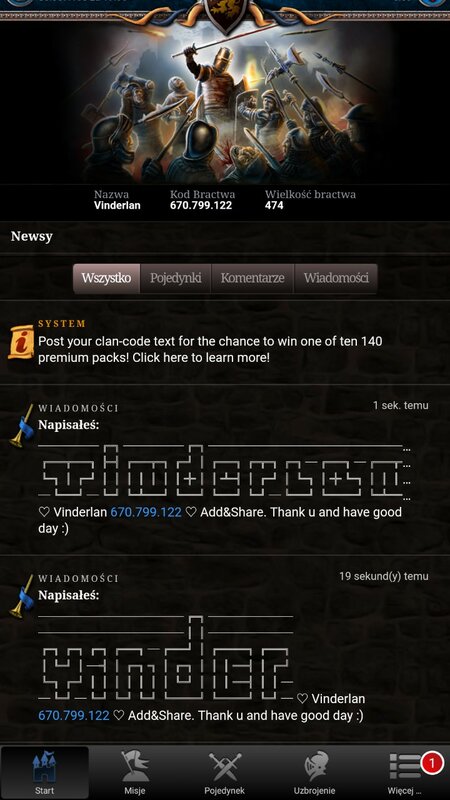 Do you have a cool clan-code image or text you use for sharing? Leave a comment on this thread with a screenshot of it and be one of 10 participants to win 140 premium (Uranium, Rubies, Bloodstones etc.) in a Star Game game of your choice. -Winners are selected by draw. -The raffle ends on the 19th of November 2018 at 9am CEST. Winners will be notified on the 22th of November latest. -Purchase does not enhance chance of winning. -Winners will be contacted via message. If they don't reply with the necessary information within a week the next participant will take their place. -Participation is only allowed once per person. Der Rechtsweg ist ausgeschlossen. Mitarbeiter des Unternehmens und deren Angehörige sind vom Wettbewerb ausgeschlossen. Nur ein Gewinn pro Teilnehmer möglich. (11-12-2018, 02:17 PM)Santorayo Wrote: [ -> ] Do you have a cool clan-code image or text you use for sharing? Leave a comment with a screenshot of it and be one of 10 participants to win 140 premium (Uranium, Rubies, Bloodstones etc.) in a Star Game game of your choice. Посмотрим чем дело кончится !!! Hai trovato o testo di codice clan che usi per la condivisione? Lascia un commento su questo thread con uno screenshot di uno o più dei 10 partecipanti per vincere 140 premium (Uranium, Rubies, Bloodstones ecc.) In un gioco Star Game a tua scelta. vincitori sono selezionati per sorteggio. -Il concorso si concluderà il 19 novembre 2018 alle 9 del mattino. I vincitori saranno avvisati il 22 novembre. -Acquisto non aumenta la possibilità di vincere. -I vincitori saranno contattati tramite messaggio. Se non rispondono con le informazioni in una settimana, il prossimo partecipante prenderà il loro posto. -Partecipazione è consentita solo una volta per persona.